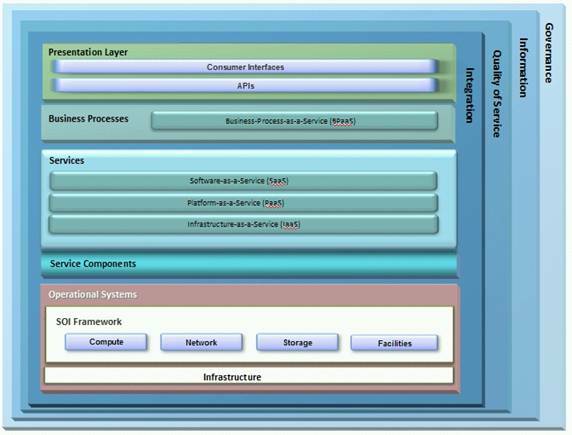 SOI and SOA RA Layer Mapping illustrates the mapping of various Service-Oriented Infrastructure (SOI) layers with the layers represented within the SOA Reference Architecture (SOA RA). In particular, the services realized within the SOI directly enable the Operational Systems Layer of the SOA RA. Cloud computing puts new demands on the IT infrastructure and management thereof. It requires an abstract approach to the operational environment. A cloud computing provider cannot any longer tailor its environment for each subscriber. It means that instead of a physical device, cloud computing offers an abstraction of a server, file system, storage, network, database, etc. Moreover, increasing providers’ profitability and maximizing the utilization of resources requires multi-tenancy, dynamic allocation of resources, and metering with charge-back. At the same time, subscribers expect to see implementation of a utility model since they want to allocate resources on-demand and pay exactly for their usage while being able to sustain their operations, much like the electric bill. Hence, new infrastructure should be agile and elastic and create an illusion of infinite computing resources available on-demand. While SOI did not offer the whole spectrum of the characteristics desired, it became an enabler for what came to be known as Service-Oriented Cloud Computing Infrastructure (SOCCI). SOCCI can be defined as service-oriented, utility-based, manageable, scalable on-demand infrastructure that supports essential cloud characteristics, service, and deployment models. In other words, SOCCI describes the essentials for implementing and managing an Infrastructure as a Service (IaaS) environment. Architecturally, SOCCI is a foundation of SOI and the cloud – SOCCI is SOI Adoption for Cloud – with a focus on requirements such as metering, chargeback, or virtual management. SOCCI is based on SOI’s ability to leverage virtualization technology and expose infrastructure services while preserving all SOI properties. However, cloud added new characteristics which simply weren’t always necessary in the case of SOI. Comparison between Traditional, SOI, and SOCCI Environments contains a comparative analysis between different types of IT infrastructures – traditional, SOI, and SOCCI. Please note that the SOCCI values in this table focus on the aspects that are common to all cloud deployment models.